Last fall, Persona 3's first movie hit theaters in Japan. Now the second film, Midsummer Knight's Dream, has made its Japanese debut, just eight months later. And while the first movie suffered somewhat from its limited scope as the story's beginning, Midsummer Knight's Dream is where the tale really hits its stride. As it was the beginning of the story, Spring of Birth had only enough time to introduce the first six main characters: Yuki, Yukari, Mitsuru, Akihiko, Junpei, and Fuuka. In Midsummer Knight's Dream, we are introduced to the rest of the main cast: Ken, Koromaru, and Aigis. The vast majority of the film's run time is spent exploring these new characters and their back stories—namely Ken and his history with Shinjiro and Aigis' relationship with Yuki. Thus, the new characters are all given their chance to shine and get easily as much development as the other characters got in the previous movie. Good – What Comes Next? In Spring of Birth, we watched as Yuki went from completely ambivalent in his odd, monster-fighting situation to strongly invested as he became friends with those around him. In Midsummer Knight’s Dream, it is clear from how he acts that he now feels as if he has found his place—a cause with those who share his goal. But as the group defeats each boss, one after the other, Yuki becomes more and more hesitant. When the shadows are defeated and their hard-fought goal is accomplished, what will happen then? Will he go back to being alone and listless in life—no friends nor cause to call his own? His personal struggle with this is the movie’s central theme and the consequences of how his doubts affect his performance have lasting consequences for him beyond this single film. However, it is clear his despair may have gone unchecked if not for his growing relationship with Aigis. 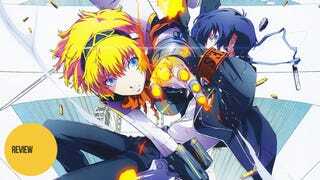 Like Yuki, Aigis feels that killing shadows is her purpose in life. Moreover, as Yuki fears that his life will lose meaning when the shadows are defeated, Aigis knows this to be true for herself—after all, she is a weapon designed to fight shadows. But while Yuki rails against this fear and struggles with it, Aigis simply accepts it. Though their ways of coping with the issue may be different, the two form a strong companionship over the course of the film. While the other characters often scoff at the idea of entering the Tartarus on non-full moon nights, Aigis is always ready to join Yuki in their shared purpose of killing shadows. But even beyond that, Aigis continuously states that she wishes to always be beside Yuki—a phase with both her intended meaning (i.e., to be beside him as their working together is the most efficient way to fight shadows) and the more romantic meaning of wanting to be with the one you love. The building of their relationship as seen in Midsummer Knight’s Dream is vital for the story that is to come—especially in light of the sequel/epilogue, The Answer (from Persona 3 FES), where it is Aigis, not Yuki who is the main player character. For her to take this role, her relationship with Yuki and how she grows from her interactions with him is paramount. While the characters fight no fewer than three bosses over the course of the film, the action in the film is somewhat light. Rather, the movie is more concerned with character building of the new characters and answering the questions raised by the first film—i.e., where did the Tartarus come from and what are the shadows? Sadly, for the most part, these questions are explained through long conversations of direct exposition. Additionally, there is a lot more fanservice in this iteration of the series, with the entire first two sections of the movie containing characters in various states of undress or in swimsuits. However, while perhaps a bit much, the fanservice is also the basis for some genuinely funny comedy—especially as the male trio of characters go around the beach hitting on every girl they come across. As mentioned earlier in this review, this movie is largely focused on the new characters: Ken, Koromaru, and Aigis. And while no doubt this makes for a good introduction to the new characters, it also has the downside of marginalizing the main cast members that debuted in the first film. Some characters, namely Yukari and Akihiko, do at least get a single scene each devoted to their development; but Mitsuru, Junpei, and Fuuka might as well be lampposts for all they add to the plot. They probably only have a dozen lines a piece in the entire film, none of which tells us anything new about them. All in all, Midsummer Knight's Dream raises the already high bar set by Spring of Birth. And like with the first film, it impressively takes a fourth of the overall story and makes it largely standalone by focusing on a thematic arc and character development. If you are a fan of the game or just someone continuing on from the last film, you will no doubt enjoy this latest iteration in the Persona 3 film series. Persona 3 The Movie: Chapter 2, Midsummer Knight's Dream was released in Japanese theaters on June 7, 2014. The third film Persona 3 The Movie: Chapter 3, Falling Down is "coming soon."